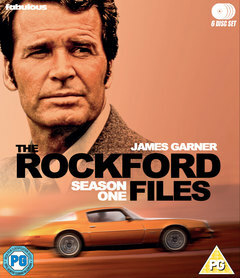 James Garner stars as Jim Rockford, a private investigator who lives and works out of a house trailer at the beach in Malibu, Los Angeles. Charging $200 per day plus expenses, he’s not the cheapest detective available, but he’s the best. Jim relies on his brain not brawn to solve a case, and frequently his charm. An ex-convict, once imprisoned for a crime he didn’t commit, Jim has a penchant for taking cases that are closed by the LAPD – those the police were sure had been resolved. Contains all 22 episodes from the classic TV series now fully restored and in high definition. Starring James Garner and Noah Berry and produced by TV legend Stephen J. Cannell. Richard T. Heffron, Lou Antonio, Michael Schultz, Russ Mayberry, Alexander Grasshoff, Jerry London, Bernard L. Kowalski, Vincent McEveety, Lawrence Doheny, Charles S. Dubin, Stuart Margolin, Jackie Cooper, William Wiard, Russ Mayberry. James Garner, Noah Beery Jr., Lindsay Wagner.